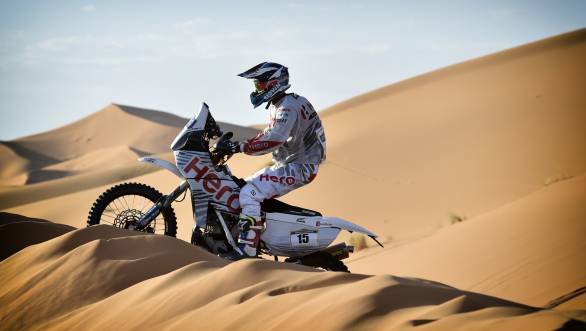 The Afriquia Merzouga Rally began with a three-kilometre long prologue held near Merzouga in Morocco. For the newly formed Hero MotoSports Team Rally, it was a matter of great learning and moderate success, with both their riders Joaquim Rodrigues and CS Santosh making it to the top 15. Rodriques, who is new to the rally-raid format, managed to take his Speedbrain 450 to eighth place, setting a time of 3min 31 sec. CS Santosh managed to finish 15th, 32 seconds behind the winner of the Prologue - Kevin Benavides. The result means that both riders will begin the rally's first stage in the first group. Santosh, will be out first on the stage, and will need to use all his navigation skills to help him through this challenge, with no rider tracks to follow. "Today was a good day for me," said Portuguese rider Rodrigues. "Earlier we had a practice lap and I actually did it twice. It was my first encounter with the roadbook. I was not super confident yet, but I learn a lot on these days. This is why we came here with the team. The prologue itself was okay, I followed the lines and stayed safe. I finished the day, tomorrow the real rally starts." "Today the feeling was good," said CS Santosh, the first-ever Indian to compete in and finish the Dakar Rally. "This morning we did the practice with two 30-kilometre roadbook sections. The bike is going good and everything is working well. The main focus in the prologue was to bring it back home and have a good position for tomorrow. That worked out fine." Managing Director Wolfgang Fischer was happy with the first day of running too, saying "The first day for Hero MotoSports Team Rally went pretty nice. We have seen the initial kilometres in the prologue and through the dunes. There is a good mood in the team and were growing together pretty fast. Now we´re looking forward to tomorrow and the first real desert stage. Joaquim Rodrigues is right in the middle of the starting order among the Top 15. CS Santosh will be the first rider out and open the track. He'll enter the dunes without any tracks in front of him. That will be valuable for him and his navigation experience." The first stage of the Merzouga Rally comprises a 165km section around the famed Erg Chebbi dunes, and through the Grande Dune de Merzouga. With four days following Monday's stages, the rally ends on Friday. We will keep you posted on the team's progress.